CISS Feature we use CISS printers on a daily basis and we know how the printer work,we are assist you when things are not working correctly,most issues are very easy corrected. CISS user instruction. 100 ml x 4 color = 400ml Sublimation ink fill up into tank. 10 Sheets A4 Sublimation Paper. Maintenance Kit ( Waste Ink tank ) N0 Yes. ink Tank installed. 10 Sheet A4 Sublimation Paper. Connect this printer to your computer easily with built-in Wi-Fi. T502 Black EcoTank Ink Bottle (127mL). T502 Cyan EcoTank Ink Bottle (70mL). T502 Magenta EcoTank Ink Bottle (70mL). T502 Yellow EcoTank Ink Bottle (70mL). The ink bottles also feature auto-stop technology and unique keys for easier filling without worry of making mistakes. CISS Sublimation System. CISS Sublimation System (Filled With Sublimation Ink). Instruction Manual for CISS. Sublimation Paper MADE IN JAPAN. HIGHEST QUALITY. Paper thickness 117gsm. High quality dye sublimation transfer paper. TESTED AND CHECKED. FULLY FUNCTIONAL AND IN WORKING CONDITION. NO INK INCLUDED. It includes up to 2 years of ink in the box. The one printer you need. Convenient wireless printing from tablets and smartphones, plus Wi-Fi Direct and auto 2-sided printing. Actual ink yields will vary considerably for reasons including images printed, print settings, temperature and humidity. Trending at $232.00eBay determines this price through a machine learned model of the product's sale prices within the last 90 days. 400ml Sublimation Ink Fill-Up into Tank. 400 ml (100 ml X 4 Colors ) Sublimation ink Fill up into Tank. 10 Sheets A4 Sublimation Paper. 10 Sheet A4 Sublimation Paper. ( Eco Tank Model ). Maintenance Kit ( Waste Ink tank ) N Y. Plus, save on ink; get up to 40 percent lower printing cost vs. color laser. This wireless printer easily prints from tablets and smartphones. Wireless and Wi-Fi Direct - print from iPad, iPhone, tablets and smartphones. CISS Sublimation System. 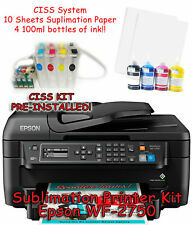 CISS Sublimation System Filled Ink. GREAT FOR SAWGRASS SG400 AND SAWGRASS SG800 PRINTERS. Sublimation Ink Over View. This is a high quality sublimation ink suitable for heat transfer to t shirts and other surfaces. 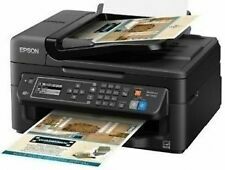 BRAND NEW EPSON EXPRESSION HOME XP-340 WIRELESS/COLOR/PHOTO/SCAN PRINTER NIB. Condition is New. Shipped with USPS Priority Mail. Brand new still in the original retail packaging from the manufacturer! 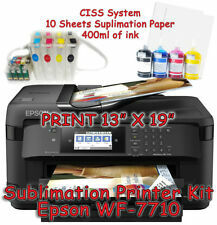 Epson WF-2630 printer bundle with CISS Kit & 800ML Dye(Regular) ink. Total 800ml(cyan,black,yellow,magenta,200ml/color) High Quality 400ml DYE ink Already filled. CISS Feature we use CISS printers on a daily basis and we know how the printer work,we are assist you when things are not working correctly,most issues are very easy corrected. Designed to copy, scan, fax and print reliably, this versatile printer gets the job done quickly, whether you're tasked with sending contracts, printing reports or distributing paperwork to colleagues. This includes the unit, power cord, and CD/DVD tray. Trending at $278.75eBay determines this price through a machine learned model of the product's sale prices within the last 90 days. 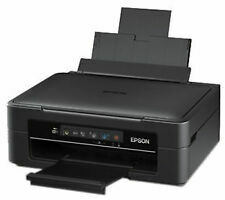 Epson ET2750 All-In-One Inkjet Printer. Shipped with USPS Priority Mail. Automatic Duplex Printing & Copying. Six-color drop-on demand MicroPiezo inkjet technology Maximum Resolution 5760 x 1440 dpi Print Speed Black: 8.5 ppm. Canon PIXMA TS9120 Wireless All-in-One USB 2.0 Inkjet Printer Scan and Copy USD 76.98. DIGITAL PRINTER EP SON C88 T-SHIRT MAKER Chroma cotton ® Ink. - 4 SYRINGES LONG BLUNT NEEDLE REFIL INK 5ml. - CD SOFTWARE DESIGN - T-SHIRT MAKER. Chromacotton digital ink color patented chemical bright color ink non-fade color ink water-proof ink, that cross-link the printed image to cotton between chromacotton ink and special coating paper for best results use chromacotton Paper applied under heat and pressure transfers the image into cotton (T-shirt) and most cotton fabrics. CISS Sublimation System. CISS Sublimation System Filled with Ink. Sublimation Paper MADE IN JAPAN. HIGHEST QUALITY. Paper thickness 117gsm. High quality dye sublimation transfer paper. GREAT FOR SAWGRASS SG400 AND SAWGRASS SG800 PRINTERS. Print, Scan, Copy, Fax. Canon PIXMA TS9120 Wireless All-in-One USB 2.0 Inkjet Printer Scan and Copy USD 76.98. Print Speed: 13.7 ppm Black/7.3 ppm Color. Copy Speed: 11 cpm Black/5.5 cpm Color. Max Paper Size: 8.5 x 47.2". Trending at $68.59eBay determines this price through a machine learned model of the product's sale prices within the last 90 days. Print, Scan, Copy, Fax. Wi-Fi Direct, Apple AirPrint, Google Cloud Print, Android printing, and Fire OS printing are supported. A 4.3" color touchscreen is present on the front panel for intuitive operation of the printer. We Have Continually Grown By Providing Quality Deals At Low Prices. 100% Original. You can expect a fully functional product. 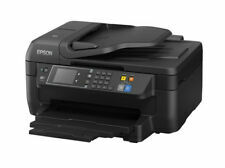 NEW EPSON L120 Inkjet 4-Color Ink Tank System Compact Printer. Condition is New. Shipped with USPS Priority Mail. Convert hardcopies to digital files from almost anywhere with this portable scanner. Automatic feeding mode helps make complex jobs go quickly, and OCR technology allows your digital files to be more versatile once they reach your computer or the Cloud. Yields up to 600 dpi optical resolution (1200 dpi interpolated) for crisp, vivid reproductions. Features 16-bit input and 8-bit output color and grayscale depth. Accepts most documents up to 8-1/2" x 72", including ID cards and receipts. 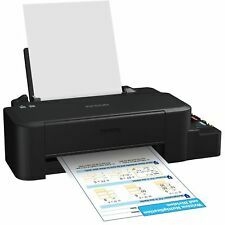 Scans a single letter-size (8-1/2" x 11") sheet of paper in just 5.5 seconds. Single-button design simplifies operation. You can scan to your computer via a USB port or directly to the Cloud with the included software. The included TWAIN driver is compatible with most types of imaging software. Canon PIXMA TS9120 Wireless All-in-One USB 2.0 Inkjet Printer Scan and Copy USD 76.98. A 250-sheet standard input tray and a 35-sheet ADF. Also, it sports an 8.5 x 11.7" flatbed scanner and can handle scanning, copying, and faxing at up to 8.5 x 14" from the ADF. Trending at $92.95eBay determines this price through a machine learned model of the product's sale prices within the last 90 days. 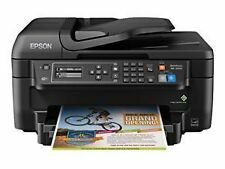 Epson WorkForce WF-7710 Inkjet Multifunction Printer - Color Brand New In Box. Condition is New. The XP-446 makes it simple to print from virtually anywhere, with or without a network even from your iPad, iPhone, Android tablet or smartphone. Complete wireless solution easy iPad, iPhone, Android tablet and smartphone printing; includes Wi-Fi Direct for network-free printing. Featuring six-color ultra HD inks, this compact all-in-one is also powerful, printing 4" x 6" photos in as fast as 11 seconds1. Quickly produce stunning borderless photos up to 11" x 17" - or print on specialty paper3 and DVDs. Model: WorkForce ET-3750. We apologize for this inconvenience. Pickup hours Kansas City, MO 64120. Wireless | Print | Copy | Scan | Fax. Complete wireless solution - easy iPad, iPhone, Android tablet and smartphone printing; includes Wi-Fi Direct for network-free printing. WorkForce WF-2750 all-in-one printer. It includes up to 2 years of ink in the box. Plus, it features auto-stop ink bottles with each color uniquely keyed for easy filling of each tank. Ink : Four EcoTank™ Ink Bottles. 3-in-1 with Wireless : Print / Copy / Scan. The 250-sheet tray lets you print more while minimizing the need for paper refills. Rear feed accommodates specialty paper for added productivity for any office. Wireless connectivity allows you to print from virtually anywhere in your office from your compatible devices. Condition is Used. Item is used but in good overall condition. · Printer have been reset to factory default setting. 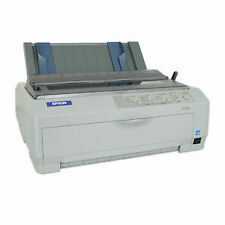 4 in 1 with wireless Print / Copy/ Fax. · Used in excellent condition. Works great with no issue! Does not included. Open Box never used, missing UPC on the box. Copy of UPC in the box. Trending at $149.96eBay determines this price through a machine learned model of the product's sale prices within the last 90 days. Nutribullet Stainless Steel 600 Watt 12 Piece Nutrition Blender USD 57.99. Flatbed Scan Area: 8.5 x 11.7". Users can create up to 99 copies without a computer and can set quality to color or black-and-white at draft or normal settings. 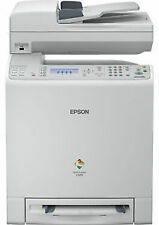 Epson Artisan 1430 Digital Photo Inkjet Printer. Condition is Manufacturer refurbished. Shipped with USPS Parcel Select Ground. 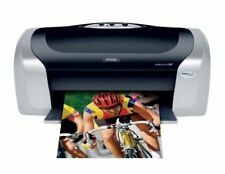 As the technology industry continues to advance, so does the capability of home printers, which are able to quickly complete large-volume jobs as well as vibrant photographs. 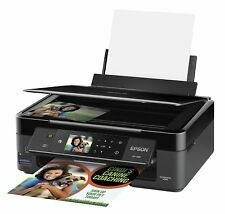 Many customers require their at-home printer to handle everything from coupons and reports to pictures for the family photo album, and Epson's selection of inkjet, photo-specific, and all-in-one printers has a variety of options to suit those needs. What is the difference between an inkjet and laser printer? Inkjet: Epson inkjet printers can effectively print items such as tickets and photographs. Inkjet printers can print in both color and black and white, and they are engineered to produce high-quality color prints. Laser: These printers are more geared toward high-volume printing needs, as they are efficient and thrive in office settings where producing large numbers of text documents is needed. The printers' ink cartridges contain a large amount of ink, so you are able to print more pages and orders without needing to replace them too often. What is an Epson all-in-one? 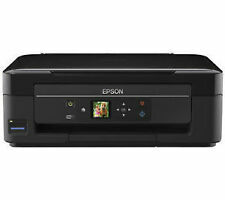 Epson's all-in-one products are machines that combine a printer, scanner, copier, and fax machine all in one unit. These Epson devices prevent the need for multiple machines, which is ideal for home use, as desk space can often be limited. These multifunctional machines have the capability to address various printing needs. 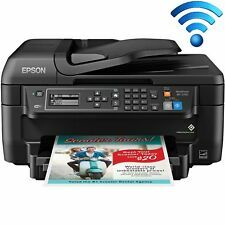 Epson Connect permits you to wirelessly link your tablet, smartphone, or computer to a nearby Epson printer, allowing you to print photos, emails, webpages, PDFs, Dropbox files, and Microsoft Office files from Word, Excel, and PowerPoint directly from your device. Additionally, Epson has partnered with Apple, making all of Epson's printers compatible with Apple devices, including iPads, iPhones, iPods, and Mac devices. These abilities are available using Epson's iPrint app. 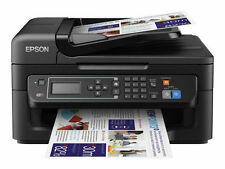 How does Epson's email printing work? Each Epson printer is provided with its own email address, and this email address can be changed once a customer purchases the product. Because each printer is identified by a unique email, you are able to access and print from your Epson printer no matter where you are. There is also a feature that allows you to limit the profiles that are able to send and print documents to the printer, providing extra security for you and your printer. Epson offers their EcoTank option with a large number of their printers. These printers do not utilize cartridges; they use super-sized ink tanks instead. These tanks can be easily filled by the customer by using the ink replacement bottles that come with the printer. Each printer comes with replacement ink that can last for up to two years and print more than 11,000 pages, and the ink colors are easily refillable as there is an auto-stop feature on each bottle that prevents overfilling.